How the "Shot Gun" Platoon Began! 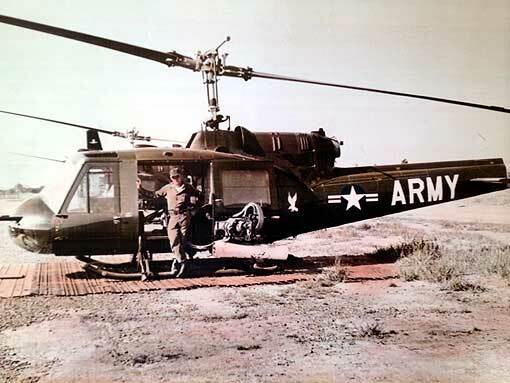 The early years of the 33rd/118th were years when Army Aviation in Vietnam was "blazing the trail" and "going where no others had gone before." When the 33rd Transportation Company deployed to Vietnam in Sept 1962, no US combat troops were in Vietnam....it was a MAAG(advisory role)action, only. The only combat troops were the ARVN. But, of course, they had American advisors. Early aviation units(Transportation Companies) had no organic door gunners authorized by TO&E. Instead, door gunners were volunteers, doubling from their regular duties from aircraft crew men, motor pools, mess halls and anywhere else they could be found. Occasionally, a man from another unit in the area (MP's) would "volunteer" to ride as a door gunner to help out. Then, a really far-out plan was "hatched" in 1962. MACV requested combat-trained men to take over the job of door gunners to man automatic weapons to protect the helicopters on operational missions. The plan was for the 25th Infantry Division in Hawaii to train and send gunners from Hawaii for short periods of time, usually approximately 90 days. This program was called Provisional Machine Gun Platoons, or "Shot Gun Platoons" for short. By late 1965, when the 25th Division fully deployed to Vietham, more than 2,000 officer and men from the "Tropic Lightning" Division had completed the training and gone TDY to Vietnam. Approximately 13 men gave their lives and more than 100 were wounded in "Shot Gun Platoons" by late 1965. In all for "Shot-Gun" One, the first group was made of approx. 106 men. From its inception, the Shotgun program was entirely volunteers. Each "Shotgunner" had to pass a Class III flight physical examination in which vision, color blindness, hearing and other physical conditions were checked. Training was primarily with the M-60 machine gun, but the volunteers also were expert with the .50 caliber machine gun, M79 grenade launcher, .45 caliber pistol, M3 machine gun, the .30 caliber M2 carbine and the M16 rifle and M14, complete with bayonet. In training, while in Hawaii, the platoons first were introduced to helicopter flight from a mock-up. They were oriented to the various gun mounts and also in free firing with the "Bungee cord." Additional training also included techniques of aerial observation and firing at various altitudes, plus how to respond with instantaneous but planned reactions. Accuracy was constantly emphasized, especially in the descent to a landing zone phase. Reports from men returning from Vietnam provided experience which honed their training through out the time period of the "Shotgun Platoons." True to military form, there was a number of different designations and changes to the original concept, but overall it remained the same for several years, only the name of the unit changing. The plan worked and can be considered a success. The very first platoon sized group to arrive at the 33rd Tranporation Company for door gunner duty came from Companies A, B, C, D, E and CSC of the 1st Battle Group, 35th Infantry Regiment of the 25th Infantry Division in Hawaii. The arrived sometime in mid March 1963. Their TDY letter orders: 03-89, from HQ, 25th Infantry Division, dtd 19 Mar 1963, stated that they were to be "TDY to: USASGV, APO 143, US Forces". Their WP (will proceed) date was " 22 Mar 63" for a period of "Approx. 90 days". The orders crypticly stated that their purpose was "In conec w mil actv" (In connection with military activity). Among the many details spelled out in the Special Instructions of their orders was, "Passports are rqr (required). Visas will be obtained immediately upon arrival" plus, "Indiv wpn will be pistol , Cal.45 and will accomp indiv." In other words, these men were the same as armed American tourists who would be guests of the Vietnamese government!! This was very early in the Vietnamese war, for sure, when it was recognized as only an "advisory" mission! On the orders were 21 men who arrived in mid-March 1963 at the 33rd/118th Avn Company in Bien Hoa, Vietnam. In addition, each Platoon member was placed on Hazardous Duty orders, by Special Orders Number 41, Dtd 15 Mar 1963, as a Noncrew member. The special instructions said: "Indiv rqr to participate regularly and frequently in aerial flights as noncrew mbr. Unless sooner terminated or suspended, these orders will automatically terminate upon PCS or rel fr asg to above duty." These orders probably were effective during the short training period provided in Hawaii prior to departing for Vietnam. the Christmas '62 holiday, or possibly New Year's holiday '62-'63, after having gone through the interview process at 1/35 Battle Group HQ with about 19 other volunteers. So, I think the planning/decision-making on Shotgun was done in '62. One of my bachelor roommates and West Point classmate, John (Jack) Veatch was waiting with me for a similar call from the 2/35 (Cacti Blue). Both of us were among the 5 Infantry officer West Point classmates selected, as I indicated before. I knew and liked Crotty, of course, and he had Shotgun 2 in June '63." "I commanded the 4th Provisional Platoon Machine-gun (Counterinsurgency), 1st Battle Group, 35th Infantry, 25th Infantry Division. We were one of five such platoons of volunteers recruited from each of the 25th's five infantry Battle Groups for an initially secret mission to an undisclosed place. We trained on Oahu Jan-Mar 63, including firing machine-guns from H-21's at 55-gallon drums in a remote valley. " the 33rd in Bien Hoa after landing at Tan Son Nhut in Saigon around 19 March of '63 under my command. We flew to Vietnam in a C121 via Guam, as I recall, and all wore short sleeve khakis and spit-shined boots. The flight was about 22 hours I think. An Army Times article once reported these five infantry platoons in March '63 were considered the first combat troops sent to Vietnam, (well ahead of the units arriving in '65). (I had already spent a week's TDY in Vietnam in '62, and was very honored to be picked for the '63 mission.)" "My platoon was assigned to the 33rd at Bien Hoa. The platoon consisted of 1 officer (me) and 20 enlisted. We lived in the 33rd compound and were attached to the 33rd under command of MAJ Henderson. In addition to commanding the 33rd's first door gunner platoon, I had an additional duty as weapons officer for the 33rd, inventorying and accounting for all weapons. I also prepared and coordinated the 33rd's perimeter defense plan with the Bien Hoa USAF base commander as another additional duty. Myself and all platoon members flew many missions as door gunners on the 33rd's H-21C's and we all received the air medal. One platoon member received the purple heart. " We returned to Hawaii in June '63. A couple of years later, we were all retroactively qualified for the aircraft crewman badge. I have a platoon roster which should get into the 33rd history in some way. Haven't yet read Brandt's book but I knew him then. When I went to Hanoi in 1994, I stopped by an art exhibit and there was Richard Olsen, one of the Olsen twins who was a 33rd pilot when I was there. We had a 33rd mini-reunion in Hanoi, of all places! Jim Strachan, Missouri City, Texas. 33rd. I did have two crossed machine-guns embroidered on one of my caps, which I still have, and I do have a gray flight suit with name and rank and a 33rd patch on the front. I have a fading photo similar to the Sept '63 photo from around Apr '63 of me in helmet and fatigues behind machine-gun in a 33rd CH21 named "Geisha Girl". " 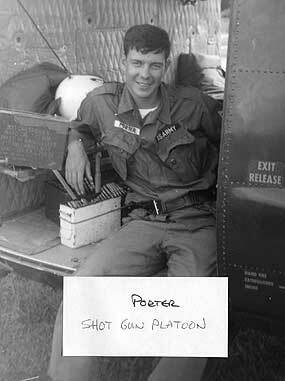 "Our only wounded gunner was PFC Larry Felty. He was grazed by a bullet under the arm while protecting a CH21 that went down. As I recall, one of Veatch's gunners at Soc Trang may have been wounded too, I think in the stomach, and those two gunners may have been the only Purple Hearts awarded in Shotgun 1, although I am not completely sure. " The second platoon sized group to arrive at the 33rd Tranporation Company for door gunner duty came from Companies A, B, C, D, E and CSC of the 1st Battle Group, 35th Infantry Regiment of the 25th Infantry Division in Hawaii. The arrived sometime in mid June 1963. Their TDY letter orders: 06-18, from HQ, 25th Infantry Division, stated that they, too, were to be "TDY to: USASGV, APO 143, US Forces". Their WP (will proceed) date was " 14 June 63" for a period of "Approx. 90 days". The orders crypticly stated that their purpose was "In conec w mil actv" (In connection with military activity). Among the many details spelled out in the Special Instructions of their orders was, "Passports are rqr (required). Visas will be obtained immediately upon arrival." In other words, these men were the same as American tourists who would be guests of the Vietnamese government!! This was very early in the Vietnamese war, for sure. On the orders were 21 men who arrived in mid-June 1963 at the 33rd/118th Avn Company in Bien Hoa, Vietnam. aircooled .30 cal machine gun at the door of an H-21. and 1LT Timothy M. Lang. The original patch of the 118th Aviation Company (AML) "Door Gunners" platoon was designed by SGT Donald Curry and SGT C.J. "Duke" DuShane in 1963. It was designed shortly after the 33rd Transportation Company was redesignated the 118th Aviation Company. 1. The center shield with the "cacti" is the the unit crest of the 35th Infantry Regiment, 25th Inf. Division, the parent regiment of the first door gunners. 2. The wings on each side of the shield stand for the flight status of the door gunners. 3. The lighting bolts stand for the 25th Infantry Division (Tropic Lightning). 4. The coffin shape of the patch stands for the fact that the gunners thought of the H-21 as a flying coffin because it was so slow and made a very large target. 3. From the General Orders, the stated Mission was: "To provide gunners to man machine guns and automatic rifles from U.S. Army helicopters in the Republic of Vietnam." These men were assigned TDY to the units in Vietnam for a period of 90 days and then most returned to their duty stations in Hawaii. Authorized strength for the 1st Prov. MG Platoon in Sep. 1964 was one(1) officer and thirty-two(32) enlisted men. However, it was not long before they were right back in Vietnam as the 25th Inf. Div. 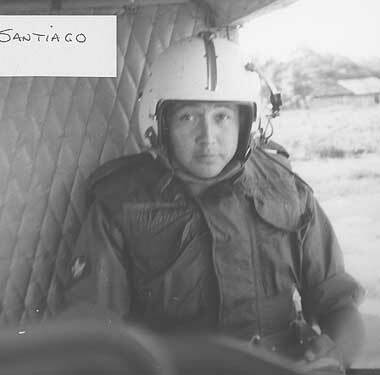 deployed to Vietnam in late 1965. 5. Finally, in General Orders # 506, dtd 30 Mar 1965, of HQ, U.S. Army Support Command, Vietnam, the platoons were re-named "Aerial Door Gunner Detachments." Plus, the number of detachments was increased to thirteen(13) from seven(7). Then, there was also added the attachment of SECURITY DETACHMENTS ALPHA through GOLF to the same Aviation Battalions. In the orders as Special Instructions, it reads, "Personnel to be rotated through airfield security and door gunner duties. Primary mission that of Airfield Security." The exact date the "Shot Gun" Platoons and Security Detachments were disbanded is not entirely clear. The TO & E of the Aviation Company was modified to include door gunners. However, it is possible the Bn's kept the Security Detachments. This likely happened about the same time the 25th Inf. Div. arrived in Vietnam. If anyone has knowledge of when this happened and has orders showing it, please forward to the Web master. Note: The 25th Infantry Division deployed to Vietnam from Hawaii in January 1966. PFC Garrett Sargent(Silverman), a gunner remembers: "LT Irving took a .51 cal in the chest while they were shut-down outside a village. He was my CO and we were really hot over this. He was a great guy and a great officer. We ran 5 miles every morning for 6 weeks with him while we were in our training in Hawaii as Shot Gunners. I think all of us would have followed 1LT Irving into Hell!" 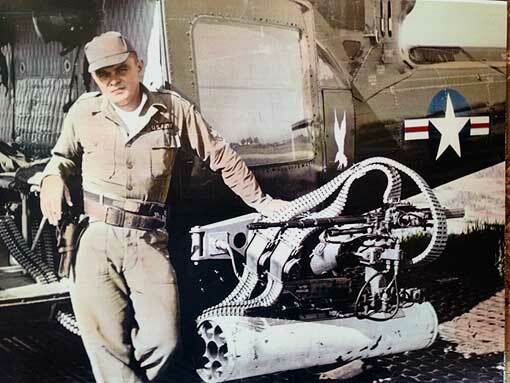 Harold "Chip" Austin, a gunner remembers: " I was assigned TDY as a door gunner to the 118th Aviation Company from the 25th Infantry Division from April to Sept. 1965). It was called the Shot Gun program. 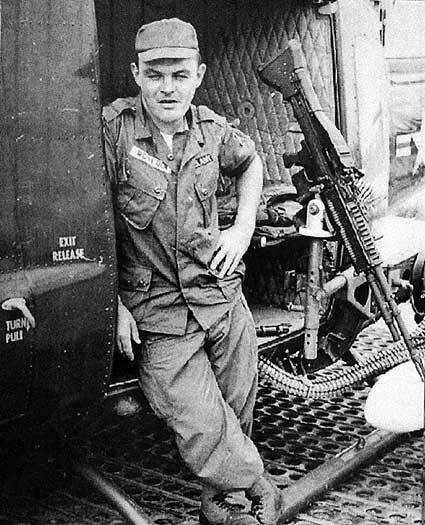 Lt. John Irving was KIA in my assigned UH1B slick ship. (I think it was ship #2 in the 1st Platoon)He bumped me off that day because he wanted to fly. I did not want to return to duty on this ship after his death and asked to be transfer to the armed platoon. I was assigned to ship #7 in the third platoon (Bandits)which was nicknamed the "Death Trap". It was the oldest ship in the platoon and sustained a lot of damage over its service life (about every exterior skin part was a different shade of olive drab touch-up paint). Within a short period of time, the old aircraft was retired and a brand new UH-1B replaced it. The prior door gunner on ship #7 was wounded and sent to Japan for treatment in the same operation that Lt. Irving was KIA. Lt. Irving's death was a severe blow to our Gunner Platoon because he was well liked and respected. We also lost another member of our Gunner Platoon named PFC Willam Oakley. He was killed when two UH1-B slick ships of the 118th aviation collided in mid-air over Bien Hoa Air Base. We left Hawaii with 28 men and if my memory serves me correctly we returned with 18." Door Gunners Imported as "Hired Guns"
SP4 Leo M. Hines, Chad Payne's gunner, who was one of the "hired guns" TDY from Co.D, 65th Engineer Bn, 25th Inf. Div. in Hawaii. Note the rocket and M-60 set-up. Rockets were 6 pound warheads. Whole affair was devised with help of UTT and adapted to the UH-1B's with intervalometers from USAF. Quite a unique adaptation for the Bandits. Bet a Gunner/CE got a scare when a rocket was fired!! Jimmy Thompson remembers: "I was with the 65th Engr Bn in Hawaii, having joined the division in May of 63. The 65th was asked to provide a platoon of door gunners to depart for Vietnam in December of 1963. I was the Platoon SGT. of that platoon. We arrived in Vietnam about the 10th of December after a trip on a C-130 that had us spending two days in the Philippines due to maintenance problems with the plane." "We arrived at Tan So Nhut and were taken by bus to Bien Hoa and the 118th. We spent 90 days there flying eagle flights and combat assaults. I also remember Colonel "Coal Bin" Willie Wilson. He was a stickler for military protocol." That was at that time when it was a five day war. When the week-end came a number of the people went to Saigon for the weekend!" Chad Payne, early "Shawnee" pilot and a member of the Bandits when they formed in late 1963 remembers: "All of our Door Gunners were volunteers from the 25th Infantry Division out of Hawaii. These "Tropic Lightning" troops came to Vietnam for 3 months TDY and were assigned as a Platoon sized unit to each Aviation Company. The 118th had one group of Door Gunners that extended for an additional 3 months while I was there. They had an assigned Platoon Leader named Tim Crotty who was my hooch mate. I was a sort of liaison between the 118th and the gunners because I had been a machine gun squad leader in the old 45th Division"Thunderbird" from Oklahoma and knew the M-1919-A6 Browning pretty well, and I was an Infantry Officer with Infantry experience." "At one point, Tim Crotty had to go TDY and was gone for a few weeks. I stood in as the gunner's Platoon Leader. I guess I was picked because I was the only aviator who could speak"Gunner". 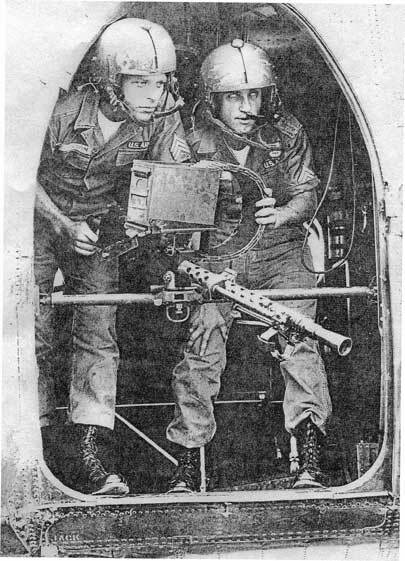 "When we got and transitioned into UH-1B Hueys, the old Browning machine guns were consigned to history and the Door Gunners used M-14's on full automatic. It wasn't all that great because of the 20 round magazine of the M-14. When the Door Gunners tried to adjust their fire by watching the tracers, they would run out of ammo many times before they got fire on the target. I am not sure just when we got M-60's for the Door Gunners." "I remember we had one M-14 blow up! The barrel peeled back like a banana. I suspect that one round lacked a powder charge and the primer drove the bullet down the barrel partway and it stopped. The next round came up behind it and the pressure split the barrel. 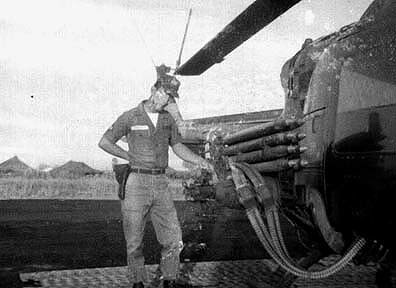 The Door Gunner wasn't hurt, fortunately, but he said it sure kicked like hell." "Gunner's Heaven" Hooch where the TDY 25th Inf. Div. gunners lived. Group of mostly 25th Inf. Div. Shot gunners in 118th in 1965. SGT Harry Long, Ira Francis , Thomas G. Fanning. Tom Carlton, a door gunner from the 25th DIV. remembers, "The term 'Shotgun Two' started about May of 1963 when the 25th DIV at Schofield Barracks in Hawaii started sending platoons consisting of one officer, a Plt SGT and 25 enlisted men to Vietnam to different bases. Each platoon was TDY for 3 months and then replaced by another platoon. I was in the second group and we were sent to Bien Hoa and the 118th. The 25th DIV came up with the idea of calling these gunner platoons, 'Shotgun Platoons' and we were very proud of our nicknames." Ted Jambon, who was 1st PLT Cmdr and an Operations Officer in the 118th during the 64-65 time period remembers the "Shot Gunners"....."They received some initial training before leaving Hawaii, and then when they got to their unit they received advanced training down at Bear Cat (near Long Thanh) just south of Bien Hoa. We had sort of a firing range setup down there. Those gunners were magnificent with the M60. I was always amazed at how accurately they could deliver fire on an enemy position. Most of the gunners who came over from Hawaii wanted to transfer into the 118th rather than go back to home. That tells you something about them, and about us." Ted Jambon continues with this story..." I didn't really get to know any of them very well as I was in Operations until just about the time the 25th came over. But there was one particular gunner, whose name was Cornelius Williams, who I made sure was on my ship & on my side of the aircraft. That guy was a virtuoso with the machine gun. I recall once we were called out on a quick reaction lift to bring in troops to bail out a unit that was meeting heavy opposition. We landed in a paddy and the VC started popping out of spider holes all around us. I was 1st Plt, Ldr. then and leading the flight. To our front about 40 yards away a man and two women popped out and started firing at ME. I yelled to Williams to put some fire on them. He looked outside to the front and said "I don't kill women"! At that moment one of the gals fired a burst from a submachine gun at him and the next thing I heard was a burst of M60 fire and the immortal words, "Die you blankety blank!, and saw her being flipped over backwards. He next hosed the the other gal and the guy who were shooting at us. As we flew over them departing the LZ, I glanced down and one was trying with her last dying breathe to lift up her weapon and get a shot at us. Williams nailed her good that time. I loved that guy, he was very good with a M60 machine gun." Shot Gun Platoon gunners in Bandits.